1. The colorful tassels on this Rebecca Minkoff cross body bag are SO cute! 2. How fun are these Sam Edelman embellished lace up sandals?! So cute and so fun! 3. I love a cute clutch! The tassels on this one are so pretty and colorful! 5. I love all the tassels on this Sole Society shoulder bag! It also comes in black as well. 6. The colors on these earrings are so cute and could go with so many summer outfits! 7. The beads on this necklace are so pretty! 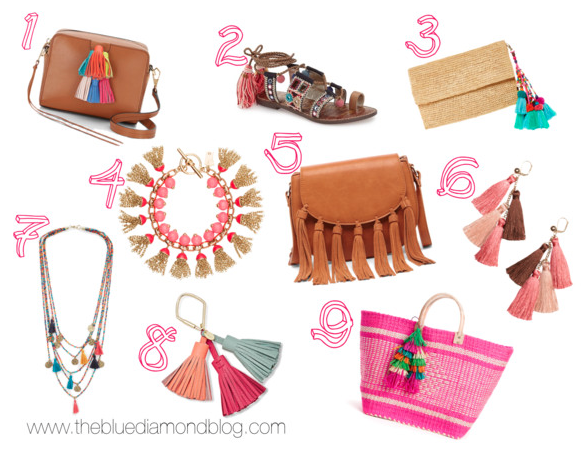 I love all the colors and cute tassels! 8. This Fossil bag charm would be so cute to add to one of your bags or even your keys! 9. Colorful totes with tassels are perfect for taking with you to the pool or beach this summer! I love the pink on this one.